Shift to a new lifestyle that brings out the best in you. Getting into your health goals this 2019 is more than just finding the right food to eat. Rather, it is a holistic discipline from body to mind to spirit. Discover how to transform your every day decisions and routines into a consciously healthier lifestyle. 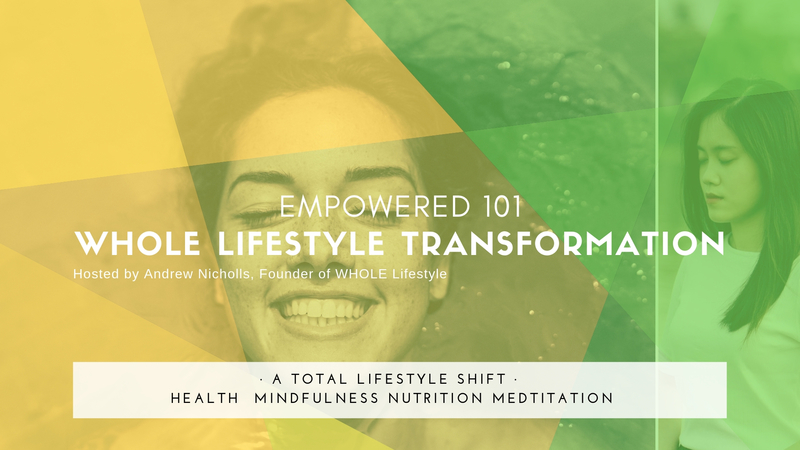 We‘ve invited the founder of WHOLE Lifestyle, Andrew Nicholls, to lead this intensive immersion course - Empowered 101. With over 30 years of experience in the field of health and fitness and holding a Bachelor and Master Degree in Sports and Wellness, Andrew will be deep diving into what creates an Empowered Lifestyle for you. Join the program and begin the WHOLE Lifestyle Transformation! “WHOLELifestyle – Empowered 101” includes the fundamentals you need to know to create a healthy and satisfying plant-based (or high plant-based) lifestyle for you, your family, friends, and colleagues. Nutritional science lectures examining research and validation of WFPB, including protein, Vit B12, and other important questions often asked relating to this lifestyle. Simple, short movement programs within 3-10 minute daily practices help you experience weight loss, increased energy, improved digestion, better skin complexion, beauty, slow aging, stay trim, get leaner and more attractive. Powerful everyday health knowledge and practices that can transform your body in a matter of days. Morning and afternoon mindfulness activities to keep your body balanced and aligned throughout. Breathing and mindfulness practices to reduce stress, improve mental capacities and deal with negativity. 6) Meditation and Presence (non-religious).